Lee Ashforth applauded the manner in which his players handled the pressure after the Blues ended an 11 game stretch without a win in the Evo-Stik League West Division. Having clocked up just two points from the 33 available to them since the last time they played Skelmersdale United in November, the heat was on as Clitheroe played the return fixture against the Blueboys at Prescot Cables’ Volair Park. Kendal Town’s 4-2 win against Market Drayton Town at the Greenfields Sports Ground had tightened things up considerably at the bottom end of the table. And when Paul McNally’s side took the lead through Alex Griffiths in the 12th minute midweek the microscope closed in on Clitheroe’s unfavourable form. The visitors could have crumbled, especially given the way in which they’d lost to Widnes in their last outing, but they were re-energised when Harry Blackburn netted the first of his brace to level in the 19th minute, turning home Max Hazeldine’s cross. Harry Pratt gave the Blues the lead from the spot just before the half-hour then, eight minutes in to the second half, leading scorer Hazeldine beat Ryan Kirkman from Pratt’s pass to make it 3-1. The home side were reduced to 10 men when John Keatley was given his marching orders before Blackburn rounded off the scoring at the third attempt in the 90th minute. “We had a job to do and we came and got it done,” beamed Ashforth. “When we first came in and only lost two in 12 games everybody was on cloud nine. We’re at the other end of that, it’s been a shocking run. It’s been bad since the run up to Christmas. “We’ve been better since the turn of the year and we’re now undefeated in three of our last five games. It’s nice to finally get that three points, especially with Kendal Town winning on Saturday. “They pulled closer to us and put the pressure on but now we can use this as a platform to kick on. “There was a lot of pressure on this game, especially from ourselves because of the run that we’d been on. “But we were also expected to win this one as well. Kendal Town winning heightened that pressure. 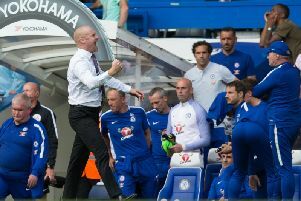 He added: “It’s important for both players and managers to win football matches and it was important to get that monkey off our back after going 11 games without a win. “Now we can’t look back, we can’t stand still. We’ve got the three points but we’ve got to move forward and start planning for Runcorn Town. They’re second in the league and flying. “Things can quickly change and you can get brought back down to earth. Confidence is high but we need to have the right attitude.